Tire maker Bridgestone isn’t the first company that comes to mind when thinking about electronic paper, but the company has been experimenting in this field for quite some time now. Today, Bridgestone claimed that it has developed the world’s first flexible e-book reader [JP]. The device, which is pictured above, uses electronic paper (instead of, say, an LCD) and will display the content on the screen even after you turn it off. Bridgestone says the prototype has a 10.7-inch-screen, is just 5.8mm thick (Kindle 2: 9.1mm) and can display color pages. 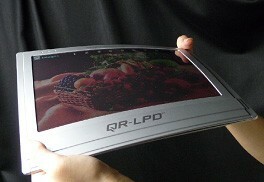 The device can be bent to some extent since the circuit board and the electronic paper are flexible. First tests with end consumers will begin in spring of next year, but Bridgestone already said it doesn’t plan to commercialize the e-book reader at this point. The company also unveiled another device that features a 13.1-inch e-paper (touch screen) that can display up to 4,096 colors, communicate with cell phones and comes with a reaction rate of 0.8sec (that’s how long it takes to refresh a screen). It’s pictured above.